A Corrosion Management System (CMS) is the documented set of processes and procedures required for planning, executing, and continually improving the ability of an organization to manage the threat of corrosion for existing and future assets and asset systems. Managing the threat of corrosion requires consideration of both the likelihood and consequence of corrosion events. For the purposes of this report, the consequence, or impact, of corrosion is considered the potential or actual monetary loss associated with the safety, environment, or asset integrity. This value is typically quantifiable when considering lost revenue, cost of repairs, and clean-up costs, as applicable. Other aspects of corrosion impact include deterioration of an asset to the point where it is no longer fit for its intended purpose (e.g., lost future production). In general, corrosion threats should be mitigated to a point where the expenditure of resources is balanced against the benefits gained. One outcome of this is that a financial analysis might conclude that a technically sound corrosion mitigation action is unjustified. To determine whether a corrosion management investment is appropriate, it can be compared to the potential corrosion consequence through a return on investment (ROI) analysis. ROI is a benefit (or return) of an investment divided by its cost. For corrosion management, the costs may include inspection and other maintenance costs and the benefit of ROI is not always measured in financial gains, but in the avoidance of safety or integrity costs. Some risks are hard to monetize including reputation and societal costs. The ROI for corrosion management can be linked to the risk-management concept of As Low As Reasonably Practicable (ALARP). It must be noted that there are uncertainties in quantifying both the likelihood and consequences of corrosion. These uncertainties include both data and models (models can include analytical expressions. numerical models, and expert opinions/mental models). Therefore, additional mitigation measures (also sometimes referred to as defense in depth) are often taken that are beyond the calculated ROI. One way to visualize the benefit of combining corrosion technology-specific activities with management system elements is through a two-by-two matrix shown in Figure 3-1. With poor corrosion technology and a weak management system, corrosion is neither controlled nor managed (i.e., it is unsafe). With sound corrosion technology, corrosion is controlled but not optimized (i.e., it is expensive). A mature management system without sound corrosion technology cannot be effective (i.e., it is unsound). Combining a mature management system with sound corrosion technology is ideal in that it results in an effective and efficient management of a degradable asset. Figure 3-1. 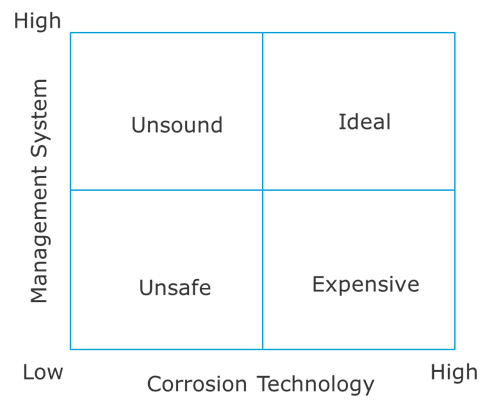 A two-by-two matrix illustrating the benefit of combining sound corrosion technology with a mature management system. Investing in corrosion management activities such as inspections and maintenance may not prevent all corrosion events because the likelihood of failure is rarely zero. Additionally, the consequences of corrosion events, when they occur, may be compounded due to system-related issues such as lack of training, not following procedures, inadequate emergency response, etc. Therefore, investing in a CMS to frame the corrosion activities with the system elements necessary for planning, execution, and continual improvement should be considered as part of the ROI.